Some of the techniques I’ll look at are already possible via filtering and calculations, however, set actions make this easier and provides more control over the end result. 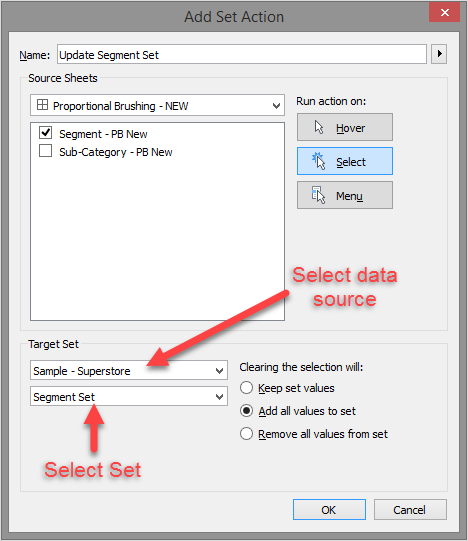 Andy Cotgreave recently wrote a post on how the new set actions can be used to achieve proportional brushing and I think this could be one of the common uses of set actions as it makes the process quicker and easier. Without set actions, this technique is usually achieved using a dual axis chart and a fixed LOD and then using either a quick filter or an action filter between two charts. 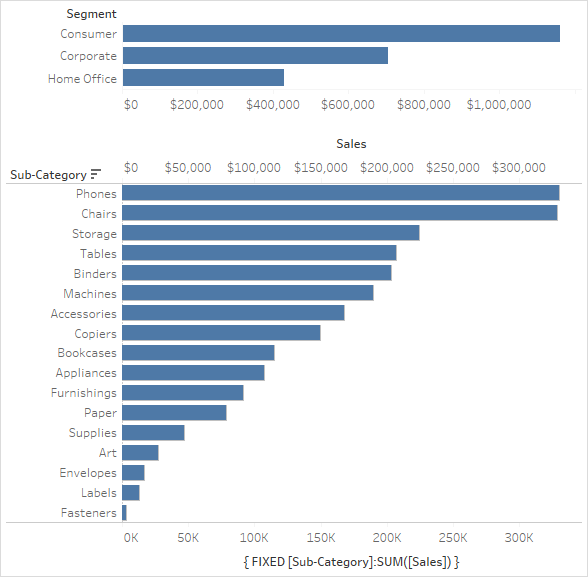 For example, the dashboard below shows sales by segment at the top and sales by sub-category underneath. There’s a filter action from the top chart the bottom chart. Which sheet will update the set: the “Segment – PB New” view. The key point, in this use case, is that no data is being filtered out of the view. The Set is just being used to encode the marks in the view. 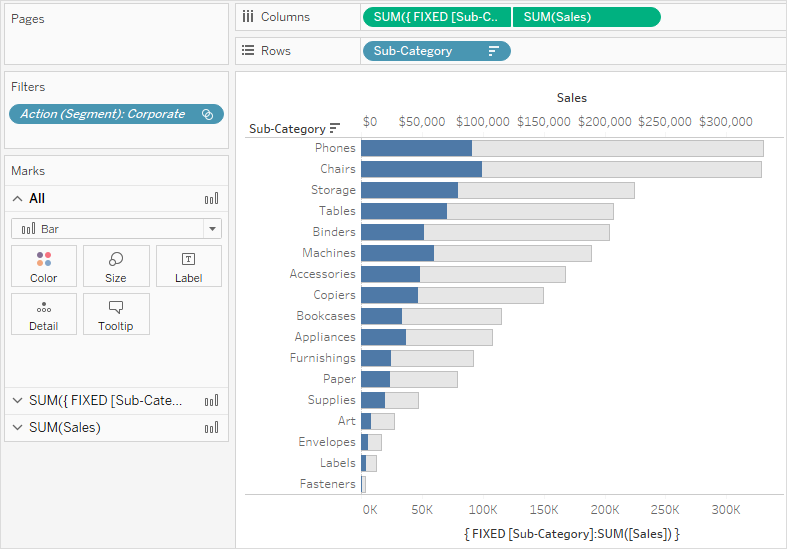 In version 10.3 Tableau introduced “Allow selection by category”, which provides the functionality to make new mark selections from within a tooltip by clicking on a dimension value that has been added to the tooltip. 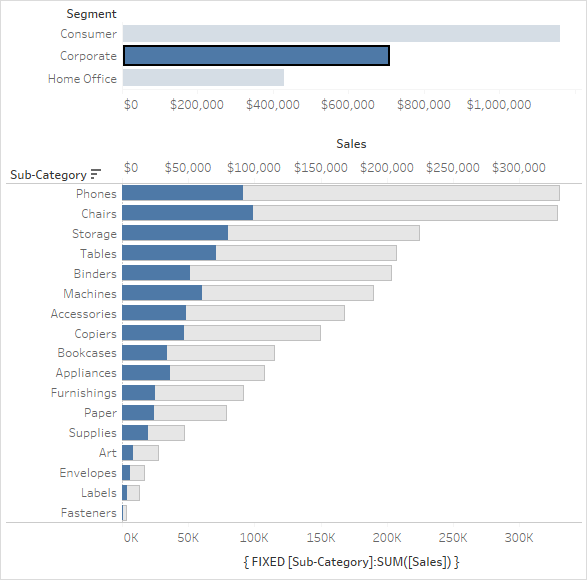 Combining this feature with Set Actions opens up interesting ways to modify the view, including the viz-in-tooltip that is showing in the same tooltip where you make a selection by category. 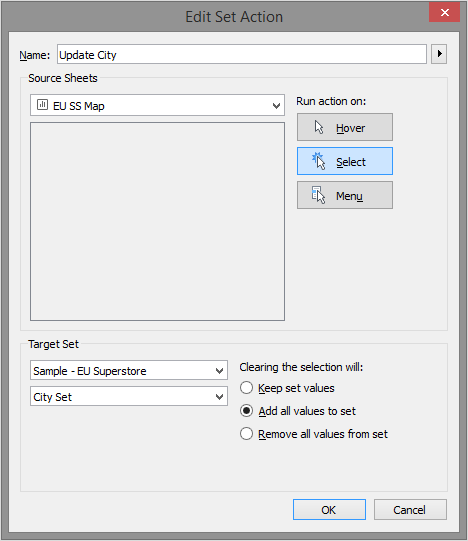 In the following example, I have created a set called “City Set” that is updated via a set action on the map worksheet. 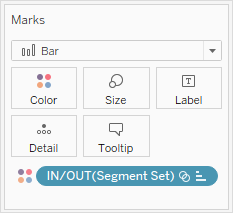 The set action is triggered whenever the user selects marks in the view, or by making a ‘selection by category’ from the tooltip. The City Set has been placed on the filter shelf of the view that is used for the viz-in-tooltip, so that view will only show the selected marks. 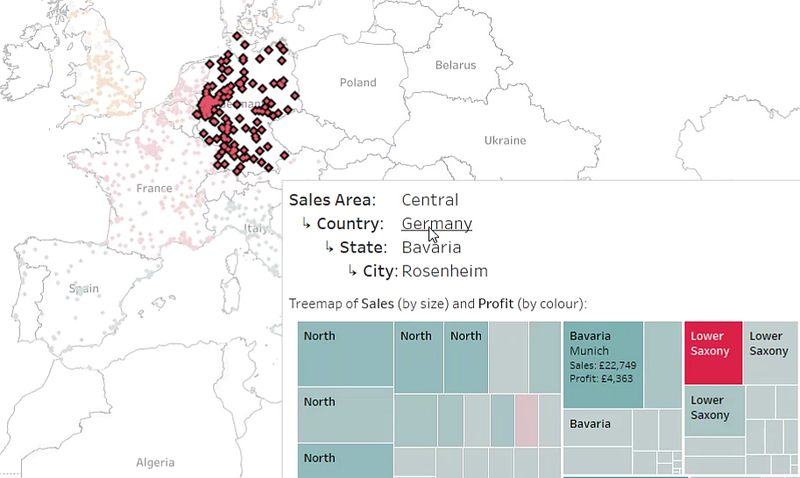 This allows the user to change the granularity of the treemap view, while also seeing the selection of marks in the background map change, giving a good sense of context of what cities are included in the treemap. 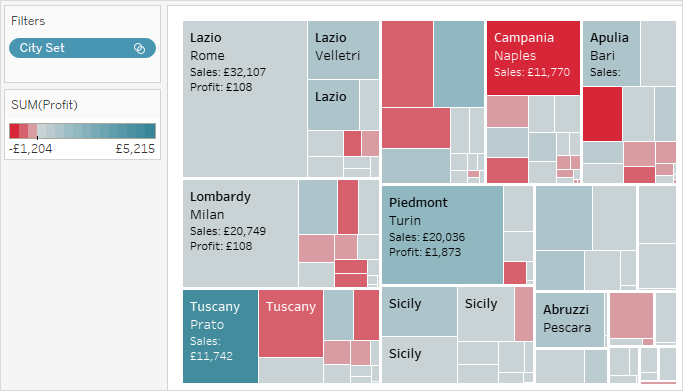 Some additional calculations have been used to only show text labels in the treemap for the geographical levels that are required at that level. At the single city level, some additional “% of total sales” metrics are displayed for that city. No one could deny that the cells in the table are highlighted, however if you don’t like yellow boxes then you’re going to be disappointed as you can’t change that formatting. 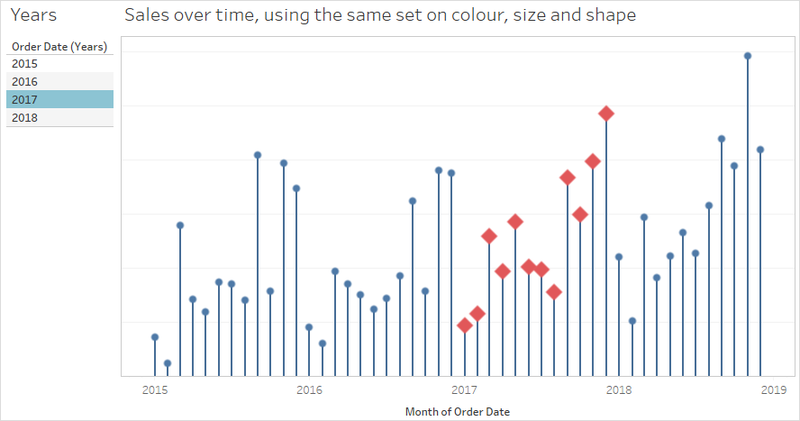 With set actions a similar effect can be achieved by creating a set as we saw in earlier examples and then placing that set on the colour shelf of the table sheet. By modifying the colours associated with members IN or OUT of the set, you can now set the effective ‘highlight’ colour to be whatever you want. Note, in this example I had to create a new calculated field that combined Segment and Year (of Order Date) and then create a Set from that new field, as using separate Segment and Year sets resulted in marks that were included in either of the sets being highlighted. You could, if desired, also add a second dimension to colour to achieve different shades of highlighting. Another advantage of using set actions is that, if you’re using a dual axis, you can apply the set encoding to just one marks card rather than both, which would happen with standard highlight actions. 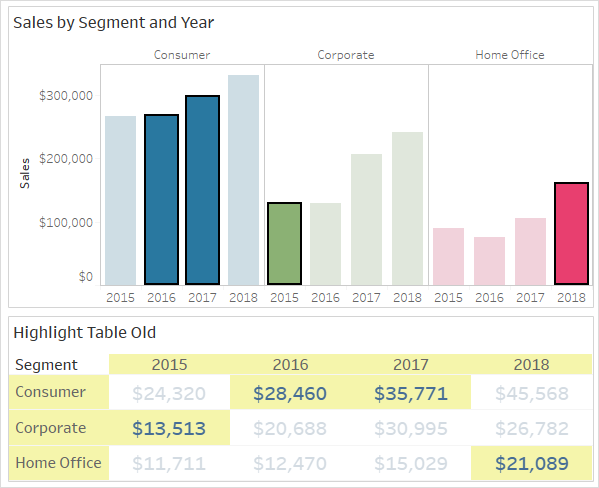 Below is an example of the standard highlight action on a chart. Marks of the highlighted year remain the same colour (both the bar and circle) and all other marks are dimmed. I’m not suggesting this is visual best practice, however, it hopefully demonstrates the extra flexibility that set actions provide for highlighting in different ways and with much finer control. 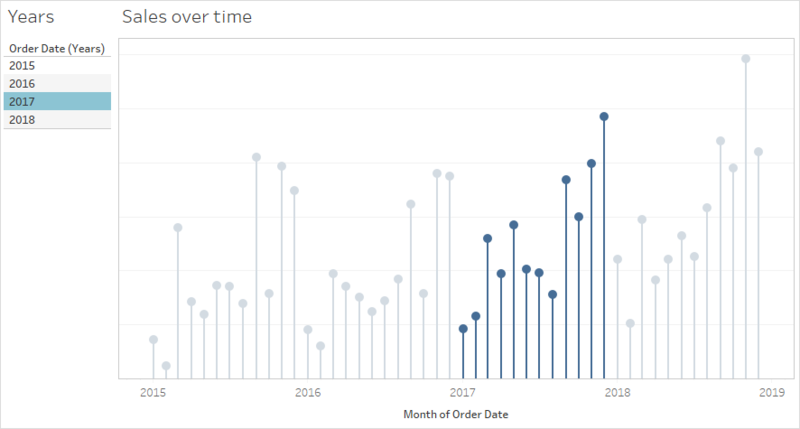 Finally, many thanks to Filippos Lymperopoulos (@flymperopoulos) and Allison Whilden (@awhildy) from Tableau’s Product Development Team who are working on this feature and took time to talk with me about the functionality and some test cases I was working on.